PFLAG At The Capitol is the true story of ‪#‎MrSinclair‬, a Southern Baptist ‪#‎Minister‬ from ‪#‎Texas‬ caught in the cross fire as a Civil Rights Activist at the historic Selma to Montgomery march and how his life journey led to the unsolved ‪#‎Murder‬ of his ‪#‎Gay‬ son, a student at the University of Houston. Events that gave Mr. & Mrs. Sinclair passionate reasons for becoming activists with the non-profit #‎PFLAG‬, Parents and Friends of Lesbians and Gays. Travel behind the scenes with PFLAG to the Texas State Capitol in Austin as they meet with elected officials and discover the ‪#‎Truth‬ behind why other members also advocate for the ‪#‎LGBT‬ Community in the South against #Discrimination in employment, housing and marriage equality. 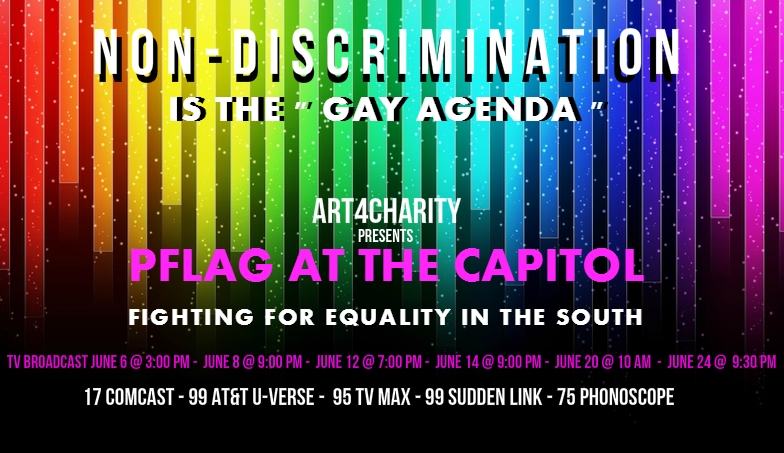 The fight for Equality meets the Southern Heat in the newest television program for Art4Charity : PFLAG At The Capitol.